Whistle While You Worship 2 : Reform worship. A couple days ago I went to Wal-Mart to grab some deodorant and milk. 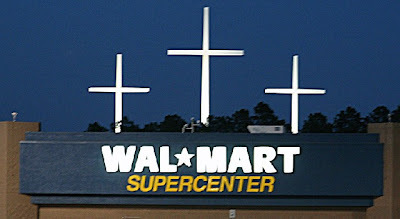 Here is a typical Wal-Mart shopping experience for me: I drive (in a worshipful way of course) through the parking lot, dodging carts, potholes, people, and cars (going the wrong way in a one way); I park, enter, grab a cart, nod at the greeter, and beamline it to the first thing on my list; I never make eye contact with other shoppers, never smile, never show any care for anyone but myself, my consumer needs. After all, my life is so much more important than everyone else's, but not that this shopping excursion is a part of my life anyway; I'm just getting stuff to help me live for real. I have been pondering how I might worship God in everything I do. Like driving was (and sometimes still is - see the first post in this series), shopping hasn't really counted in my mind as an actual life event. It's just something that has to be done, so I take off Christ and, like a robot, soul-less and lifeless, git 'er done. Shopping has just been something that happens "on the way" to my real life events. How foolish of me to disregard what happens "on the way" to what I consider most important in my life (family, ministry, my relationships). I wonder how many times in the Gospels and the book of Acts Jesus and the disciples were "on their way" somewhere, and they considered their journey just as important as their destination. I wonder how many lives were touched and transformed by their awareness to what was always happening around him. How foolish of me to think the Spirit of Christ is only at work in events that I think are important. So this particular shopping experience was different. It was hard, and I really had to focus, but my entire attitude shifted from cold self-centeredness to joyful Christ-centeredness, as I asked God for an awareness to what His Spirit might be doing. This act of worship naturally put a smile on my face, caused me to keep my head up, to make eye contact with people I crossed paths with, and, I believe, ultimately brought glory to God. I guess I'll bring the dwarfs' whistle ditty out of the car now and into the store, "Wor-ship-while-you-shop" (whistle). One more thing, I do think there is a difference between what I'm talking about and simply being nice. I nice person can be thoughtful and kind and "Christian" and still be self-centered and (since we're talking about shopping) consermeristic, materialistic, etc. My point is that we all, the cold-hearted (me) and the warm-hearted alike, can and should be more aware of what the Spirit is doing "on the way." This is just as much an act of worship as singing worship songs in church, and it may even be more glorifying to God considering the evangelistic nature of this kind of worship. I pray that you and I would be more conscious of what God is up to in everything we do. And I pray that joy would fill our hearts, even in the inner most crevices of the earth.